I was delighted that my silly question about how you clasp your hands prompted such a lot of fun and thoughtful comments. Just so you know, I am left-handed and I clasp right thumb over left. The KOARC is right-handed and clasps left thumb over right. Carissa pointed out this interesting article written in 1932 in The American Naturalist about the subject of hand clasping and arm folding. You have to be a subscriber to read the whole article, but I found the first page that displays on the link very interesting! Thanks, Carissa! Although it was not the popular favorite, my new socks will be called Trilobite Socks. Here’s the first sock, completed. I have long had a fondness for trilobites, and when the pattern for this sock first began to emerge, that’s what I thought it looked like. My fondness for trilobites can be traced back to a toy my brother and I got one year for Christmas: Creepy Crawlers. Anyone else have a Creepy Crawler set? Remember Plasti-Goop? Ah, childhood! The trilobite was my favorite Creepy Crawler. On this page there is an excellent photo (scroll down) of all the Creepy Crawler molds (the trilobite is in the mold in the top row, center). Looking at that picture really brings back memories! I wonder what happened to all the Creepy Crawlers my brother and I made? Just so you know, I’ll be sending the prizes out a few at a time — so it may take a little while before you get your prize if you were among the winners. Thanks for your patience! I’m so pleased that so many of you have reported success in purchasing my patterns from The Loopy Ewe. As I told some of you, I sent a huge number of them out to Sheri, in hopes that they’d stay in stock long enough for you to be able to pick and choose. It seems to have worked — a few of them are out of stock, but a number are still available. And fear not — Sheri will re-stock the ones that have sold out. She’s just placed another huge order with me. Thanks so much for your enthusiasm in purchasing them. You really know how to make a girl feel wanted, you know? I know I’m loved and wanted! Yay, I’m first! I think the new sock looks great, and I’ll definately be buying this pattern! I had a creepy crawler maker and then I had some kind of bug maker that you could eat. I can’t remember the name of it. They tasted awful but we ate them anyway. So cool that they’re “Trilobite Socks!” That was my guess too. I had forgotten all about the Creepy Crawlers, so this was a lovely walk down memory lane. That was one of my very favorite toys. I also have a fondness for Trilobites, although I’m not sure that it stems from that set. Interesting to ponder, nonetheless. I used to have something like Creepy Crawlers, only mine made sort of dry plastery monsters that I could paint, instead of producing bugs. I never played with it much, though. Love the Trilobite socks. I used to play with my big sister’s Creepy Crawlers set. I loved that thing, but it was easy to burn yourself. Looking at the link brought back fond memories. Thanks. I can still smell the scent of cooking goop…great stuff. I like how your patterns work so nicely around the foot then through the heel and seamlessly to the ribbing. Congratulations on the success of your beautiful patterns! There is a Creepy Crawler contraption in my basement as I type! I loved the Creepy Crawler machine when I was a kid – made a pond life habitat with the molds that made turtles and things (it wasn’t all bugs! :)) When I saw it greatly reduced at Toys R Us one year, I bought it for my boys along will some add ones – you can make jumping bugs! My boys have outgrown it now, but they enjoyed it as much as I did as a kid! Creepy Crawlers!!! Oh wow, I haven’t thought of them in years. I had a set and I played with it a lot. Trilobite is the perfect name for those socks. Awww, can’t believe that you had a Creepy Crawler set. The neighborhood delinquents had one and we wanted one so bad. Mom would have none of it. Too easy to burn ourselves. Didn’t get an Easy-Bake Oven either. And my kids think that I’m depriving them. Sheeesh. We had a Creepy Crawler set too. We also had the Incredible Edibles. They were bugs you made that you could eat. Love the sock patterns, Wendy. I used to have the Incredible Edibles set. I remember my Grandmother getting upset whenever we ate the bugs. Oh my God! I LOVED the Creepy Crawlers! I can still remember the unique smell of them. We had the original Easy Bake Oven too, the one made of metal. Can’t believe they’re made of plastic now. I sure wish we would have kept that cool stuff. Toys have certainly changed! I just live for your Lucy pictures, and today’s is one of the best! Talk about loved and appreciated! P.S. I’m so old I have no idea what a Trilobite is, not to mention a Creepy Crawler. I still love the socks! I remember buying the Incredible Edibles set for my daughter so that I could play with it. I think she had the Creepy Crawlers, too. And I, for one, love trilobites. Love the socks, but what else is new. Now if I only had time to knit all of your patterns! Yahoo! You made a paleo geek knitter very happy. I may have to buy some new sock yarn for the occassion! Wow I can’t believe that you thought of the Trilobite too. I thought that it might have been on the odd side, but that was what they reminded me of. They look great! I would sit in my basement for hours making all sorts of bugs and creepies – remember the glow in the dark plasti-goop?? I loved making the little crab in glow in the dark and putting them in my brother’s bed, hehehe! I had the fun flowers set too but i didn’t like it near as much as the creepy crawlers! If those studies were done in 1932, most “lefties” were forced to become right-handed back then. The results of the study were probable a bit skewed. Now THAT brings back memories! Creepy Crawlers! What a great toy! You realize of course, they could never sell it today cause someone could drink the plasti-goop or burn themselves on the thing maker. I seem to remember the smell of the critters cooking. Ever see the new Mr. Potato Heads? Nothing sharp. And there’s almost no metal on the playgrounds these days. We may be old but at least we had better toys. I guessed Trilobites also!! Yeah!! I also was a proud owner of a creepy crawler set. What fun my brother and I would have making these creepy bug things! !…………………..I really do not like insects much, but hey we were kids!!! I was able to get one of your lace patterns so was very pleased. 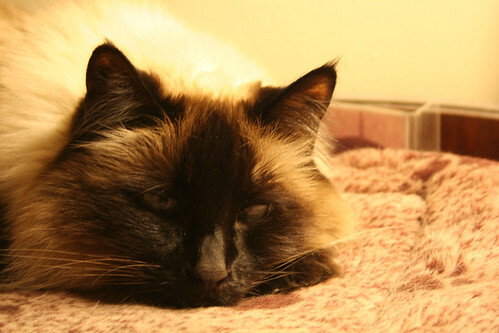 Lucy is such a beatiful little lady!!! I was reading Bonnie’s comment…………What ever happened to teaching our kids not to drink the goop! We had good toys not ones from China that have to be recalled because they could poison you!!! I think we were much safer with American made toys! Speaking of the flurry of SOS, and not creepy crawlers, sorry… did anyone else have a less than satisfactory experience with Fiesta yarn? I purchased several skeins of Boomerang and recently cool water soaked, then blocked the Moroccan colorway. It faded big time and really stretched. 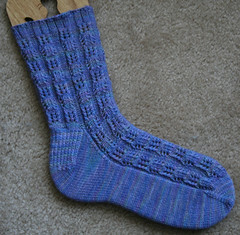 I used the Sensational Socks Moorish Lattice pattern. Before soaking, the yarn looked lovely and fit snugly. Bummer! So tickled you chose “Trilobite” for your new sock pattern–it was my favorite name, too. And dang if I don’t remember playing with those Creepy Crawler sets, too! Love the trilobite name & sock. I also loved Creepy Crawlers. Remember Incredible Edibles, the weirdly delicious version of Creepy Crawlers, and that vacuum thing that made cars? Are you sure you didn’t live down the street from me? 1.Creepy crawlers–that’s how I know what a trilobite is!!! 2.Can’t find Hearts for Heidi patter, this AM or now.Will it beon Loopy Ewe? Congratulation Wendy!My favorite are this Trilobite and Hearts for Heide,i am waiting to get this patterns,ok! I remember adoring the asparagus socks you knit over the summer. I was looking for the pattern at Loopy Ewe but didn’t see it. Is it being offered for sale? Hee hee, Creepy Crawlers! I remember those. *pat pat scritch scritch* Hi Lucy! I have bought a number of your fabulous patterns from the Loopy Ewe and was wonfering if you planned on offering the Lacy Rib pattern as well???? What about making a small book of sock patterns…just a thought. Are you going to Stitches? Wow, what a great toy. I know my brother and I would have loved it. The socks are beautiful. I’m pleased to say I scored two patterns yesterday — thanks so much for working so hard to keep them stocked! Of course I had to get some yarn – I’m going to try to design a pair for my daughter. I’ve got the idea in my head, just need to get it to needles. Yay, sock patterns – I finally got all that I wanted (except Asparagus ones but that’s ok). And I loved creepy crawlers! My daughter has a bug making set too, but they bake in the toaster oven instead of a “thing maker.” Then the dogs eat them. Wow, Creepy Crawlers! The instant I read that, I swear I could smell that plastic goop heating up. Ah, childhood memories. Of course, it was my brother’s set, and I wasn’t allowed to play with it since I was just a girl. All I could do was watch…and sniff. Not that I’m bitter, or anything…..
During stage one of the cleaning of the parents’ house this summer (preparatory to a new roof being put on next spring) I swear I saw my brother’s creepy crawler set. As well as his plastic toy soldier maker, the GI Joe collection, my Brier horse collection and what suspiciously looked like one of my Barbie’s that was used as a casualty for Joe to rescue. Ah, the fond memories of childhood. I voted for Trilobite Socks, too. Good heavens, I’d forgotten all about Creepy Crawlers! I just thought you were one of those brainy kids with her nose in an encyclopedia all the time. Sure, trilobites are great. Your patterns are great, too. I’m sorry you were sick all summer, but at least you put your time to good use. I am hoping to see Hearts for Heidi at Sheri’s soon. I WONDERED about the whole right- or left-handed thing when you initially asked the question. I’m intrigued that you stated that you’re left-handed because I clasp my hands EXACTLY like you do and I’m RIGHT-handed. I mentioned (in my comment that day) that I have cross-dominance and it shows up in other ways, too. I always take pictures with the camera held up to my LEFT eye, I aim a gun (not very often) with my LEFT eye, and I shoot pool LEFT-handed. Now I can add hand-clasping to my oddities! Now I’m going to start checking how people cross their arms! My dad was a fossil collector and Trilobites were his favorite. Seeing those puts a nostalgic smile on my face. OMG…CREEPY CRAWLERS! My brother and I also had–CREEPLE PEOPLE–same goop, different molds. A bit like the TROLL dolls. Even had the same fuzzy stuff for their hair. I remember that I customized my real TROLL- by adding that fuzz for streaks- LEMON YELLOW streaks for bright, ORANGE TROLL HAIR! I’ve wondered what the fallout from those FUMES would be. We also hid the burn marks on our hands caused by the HOT molds. Yes, ahhhh childhood! And I was a fiber lover- even then. Oh yes, I remember the Creepy Crawler set and how we burned our fingers on those metal plates! And I also remember the Easy Bake Oven and Thumbelina 🙂 Do YOU? So do you knit left- or right-handed? Yahoo! I guessed the name correctly. I took one look and thought – those look like trilobites – the fossil I’ve never been able to find on any of my fossil expeditions. People around me find them in droves, me -none. I just think it is the perfect name for those socks. I hope I have the opportunity to purchase it shortly! PS: I hope your back issue is maybe getting better? What I found interesting about the article is that it had a fairly 50/50 distribution, but your poll has a clear “leader”. I wonder why? I also wonder about the cross-dominant thing Marji mentioned. I’m right handed (left thumb on top) but left eye dominant and always did cart-wheels and things like that left-handed. Such interesting subjects come up on knitting blogs! I didn’t have a Creepy Crawler “machine” I had an Incredible Edibles “machine instead!!!! No girly Easy Bake Oven for me. I wanted to eat my bugs. Yay for trilobites! Takes me back to 8th grade Earth Sciences! Can’t remember the teacher’s name, but I distinctly remember her infectious love of trilobites. LOL! I just got my daughter a Creepy Crawler set on Sunday. Sadly she’s been too sick to enjoy it but I’m sure that once she’s better we’ll be seeing creepy crawly things all over the house. Tool old to have had Creepy Crawlers, but my kids did and I had just as much fun with it as they did…until one day I picked up a huge black beetley thing thinking it was one of their creepy crawlers! Yikes! Screaming and dancing all over the place..
creepy crawlers for the boys and I got a Chatty Cathy that my brother promptly broke. That new commercial starring Chatty Cathy creeps me out! My first comment ever on a blog – love it. If knitting socks is your thing to-day you do it and let the others be. Some people have to make snide remarks and I have long ago decided it is because they are jealous/envious. So sock it to them everytime.